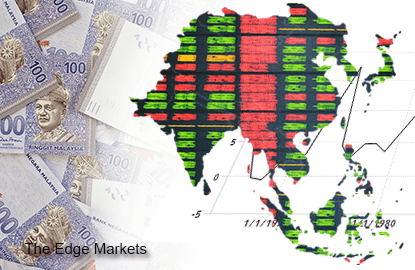 SINGAPORE/SEOUL (Sept 3): Most emerging Asian currencies fell on Thursday, as global growth worries and mounting caution ahead of key U.S. jobs data being later this week meant a recovery in global risk sentiment was unlikely to last long. "Investors are now adopting a 'we are not buying it this time' attitude, preferring to be defensive and go with a long dollar bias instead," said Emmanuel Ng, a foreign exchange strategist with OCBC Bank in Singapore. Malaysia's ringgit slumped in thin liquidity as Swiss authorities said they had frozen funds in Swiss banks, amid investigations of troubled state fund 1Malaysia Development Berhad on suspicion of corruption and money laundering. as much as US$6.6 billion. posted last month, as consumer sentiment in August fell for an eighth straight month. Asia-Pacific stocks outside Japan turned weaker, failing to maintain their earlier gains after a 2% jump on Wall Street. Sentiment towards emerging Asian currencies stayed bearish, although China's efforts to stabilise the yuan after last month's devaluation eased pessimism on regional units, a Reuters poll showed earlier. As Chinese financial markets are closed for holidays, investors focussed on August U.S. nonfarm payrolls due out on Friday for clues on the likely timing of a U.S. interest rate rise. Nonfarm payrolls likely increased by 220,000 jobs in August after rising 215,000 in July, a Reuters survey of economists showed. The ADP National Employment Report on Wednesday already showed that U.S. private companies maintained a steady pace of hiring in August, suggesting labor market momentum likely remains strong enough for the Federal Reserve to consider a rate increase this year. Once the official jobs data adds to expectations for the Fed tightening, emerging Asian currencies may weaken further, analysts said. Asian central banks are facing pressure for further easing to cope with slowing inflation and growth. The won slid as traders added dollar holdings, before the Tesco deal is finalised. The British supermarket has picked MBK as preferred bidder for its South Korean unit, as the retailer retreats from overseas and focuses on revitalising its domestic business. "Given potential dollar demand for the deal, preference for long dollar positions may persist for the time being," said a foreign bank trader in Seoul. The South Korean currency came under further pressure as foreign investors were net sellers in the country's main stock market for a 21st consecutive session, the longest selling spree since July 2008. Foreigners dumped a combined net 4.4 trillion won (US$3.7 billion) worth of stocks during the period, the Korea Exchange data showed. The rupiah lost 0.3% to 14,166 per dollar, its weakest since July 1998. The currency came under pressure from capital outflows with most government bond prices down. Importers also bought the dollar for payments. The official Jakarta Interbank Spot Dollar Rate, which the central bank introduced in 2013 to manage exchange rate fluctuations, was fixed at 14,160 rupiah per dollar, the weakest since the launch. Bank Indonesia was spotted intervening around the session's low to stem further depreciation in Asia's second-worst performing currency this year, traders said. * China's financial markets are closed for a holiday on Sept 3 and Sept 4. Markets will resume trade on Sept 7.